In 1991=1+9+9+1=2, his Mercedes-funded race debut for the Jordan Formula One team resulted in Schumacher being signed by Benetton Formula One team as their driver for the rest of that season. Establishing himself as a top driver.Schumacher returned to Formula One on a permanent basis from 2010(2+0+1+0=3) with the Mercedes team before retiring for a second(again 2) time at the conclusion of the 2012(2+0+1+2=5) season. His best finish was fifth(again 5) in his second race, the Italian Grand Prix, in which he finished ahead of his team-mate and three-time World Champion Nelson Piquet. Benetton B192 Schumacher took his place on the podium for the first time, finishing third(again 3) in the Mexican Grand Prix. In 1995 Schumacher successfully defended his title with Benetton. He now had the same Renault engine as Williams. He accumulated 33 (again 6) more points than second-placed Damon Hill. With team-mate Johnny Herbert, he took Benetton to its first Constructors’ Championship and became the youngest two-time(again 2) World Champion in Formula One history. In 1996(1+9+9+6=again 7), Schumacher joined Ferrari, a team that had last won the Drivers’ Championship in 1979 and the Constructors’ Championship in 1983, for a salary of $60(6+0=again6) million over 2 years. Schumacher finished third*(again 3) in the Drivers’ Championship in 1996 and helped Ferrari to second place in the Constructors’ Championship ahead of his old team Benetton. He won three races, more than the team’s total tally for the period from 1991 to 1995. After missing six (again 6) races he made his return at the inaugural Malaysian Grand Prix, qualifying in pole position by almost a second(again 2). Schumacher won his third(again 3) World Championship in 2000(2+0+0+0= again 2) after a year-long battle with Häkkinen. Ferrari won 15(again 6) out of 17 races, and Schumacher won the title with six(again 6) races remaining in the season, which is still the earliest point in the season for a driver to be crowned World Champion,Schumacher broke his own record, shared with Nigel Mansell, of nine race wins in a season, by winning eleven(1+1= again 2) times and finishing every race on the podium. In 2004, Schumacher won a record twelve(1+2= again 3)of the first thirteen races of the season, only failing to finish in Monaco after an accident with Juan Pablo Montoya during a safety car period when he briefly locked his car’s brakes. Schumacher’s win in 2005(2+0+0+5= again 7) came at the United States Grand Prix. Schumacher retired in six (6)of the 19 races..
2006 became the last season of Schumacher’s Ferrari career. The press release stated that Schumacher would continue working for Ferrari. It was revealed on 29 (2+9=11=1+1= again 2)29th October 2006 that Ferrari wanted Schumacher to act as assistant to the newly appointed CEO Jean Todt.This would involve selecting the team’s future drivers. Schumacher’s first drive of the 2010(2+0+1+0= again 3) Mercedes car – the Mercedes MGP W01 – was at an official test in February 2010 in Valencia. He finished sixth(again 6) in the first race of the season at the Bahrain Grand Prix. At the Monaco Grand Prix Schumacher finished sixth after passing Ferrari’s Fernando Alonso on the final corner of the race when the safety car returned to the pits. However, he was penalised 20(again 2) seconds after the race by the race stewards dropping him to 12th(1+2= again 3). Schumacher’s 2010 season ended with a first lap crash at the Abu Dhabi Grand Prix. At the Indian Grand Prix Schumacher started well and finished fifth(again 5) after overtaking Rosberg at the end of the race. Schumacher diced again with Rosberg in Abu Dhabi Grand Prix, battling over sixth position on the first lap. Schumacher qualified fastest at the 2012(again 5) Monaco Grand Prix. In August 1995(1+9+9+5= again 6), Michael Schumacher married Corinna Betsch. 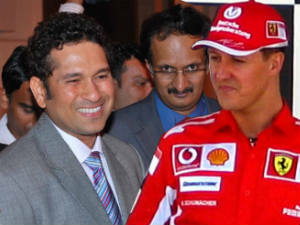 In 2004(2+0+0+4= again 6), Forbes magazine listed him as the second highest paid athlete in the World 2005(2+0+0+5= again 7), Eurobusiness magazine identified Schumacher as the World’s first billionaire athlete. The seven-time (7) F1 racing champion, Michael Schumacher, is still under a medically induced coma after suffering severe head injuries in a skiing accident last December 2013. His wife, Corinna, reportedly sold the family’s luxury assets to support Schumacher’s medical bills. The F1 legend has an estimated net worth of more than $750(7+5+0=12=1+2=3) million according to International Business Times. Last Saturday, Corinna sold her husband’s £25(7) million ($39 (3)million) jet and even considered selling the family’s home in Meribel, France, the area where the ski accident happened, to cover the costs of rising medical bills. Finally Visharada Numerology Wishing him a speedy recovery and looking forward to have you back soon.